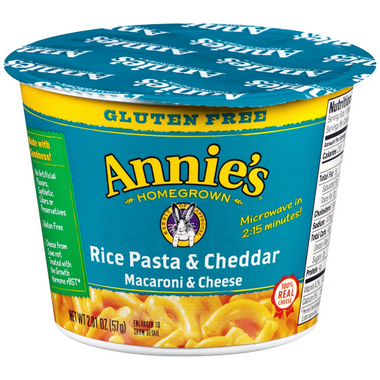 Try a gluten free variety of Annie’s microwavable mac and cheese cups, Rice Pasta & Cheddar! It’s made with rice pasta, 100% real cheese and no artificial flavours, synthetic colours or preservatives. Just add water, microwave 2:15 minutes and enjoy. Ingredients: Rice Pasta (Rice Flour), Tapioca Starch, Cheddar Cheese (Cultured Pasteurized Milk, Salt, Non-Animal Enzymes), Corn Starch, Nonfat Dry Milk, Organic Coconut Oil, Whey, Butter, Salt, Potassium Chloride, Cultured Whole Milk, Sunflower Lecithin, Sodium Phosphate, Annatto Extract For Color, Silicon Dioxide For Anticaking. Contains coconut & milk ingredients. Always refer to the actual package for the most complete and accurate information. I really like these! I keep them in my desk drawer for when I'm in a pinch for lunch or snack during a busy day. I found it pretty cheesy, and was super fast and easy. A good thing to have on hand! Love having a couple of these on hand for those chaotic days that don't leave much prep time for making lunch for my toddler. Perfect size to pair with some fruit for a quick lunch I don't feel guilty serving him. As far as microwaveable pasta goes, this is ok! The GF version isn't too gummy as others.